Rheumatology is the branch of medicine devoted to the diagnosis and therapy of rheumatic diseases. Rheumatologists deal mainly with clinical problems involving joints, soft tissues, blood vessels (vasculitis), connective tissue disorders and autoimmune diseases. Dr. M. Madeshwaran, Consultant Rheumatologist at our Royal care Hospitals is a highly qualified doctor and a specialist in this field. 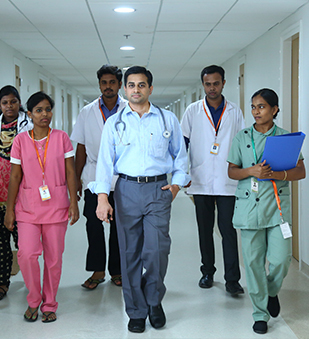 He has an illustrious career holding post graduation degree of MD Paediatrics (2010-2013) from renowned institute Banaras Hindu University, U.P and DM Rheumatology (2013-2016) from the prestigious Madras Medical College, Chennai. He was selected as an Indo-UK fellow to observe the rheumatology clinics in The Bristol Royal Infirmary, Bristol, England following his specialisation. Under his guidance, we promise to serve our patients with excellent care and support. Multidisciplinary team: We liaise with a team of general physicians, orthopaedicians, paediatricians, specialists of other department and physiotherapists for the holistic treatment of our patients.